Was Ed McMahon's Star Vandalized? On Wednesday night, this is what Ed McMahon&apos;s Hollywood Walk of Fame star looked like just outside of the Roosevelt Hotel. There were no flowers or no notes, just newspaper stuck to the sidewalk with some black paint or tar over his name. Accident? Vandalism? Probably the latter—there are some crazy and mean spirited people out there. 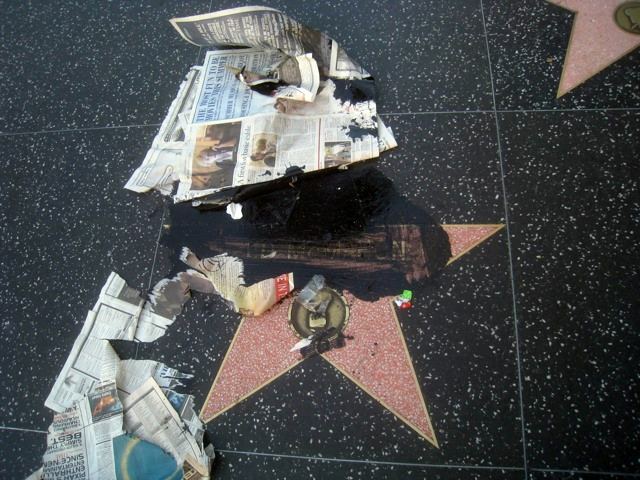 Luckily, the Hollywood Chamber of Commerce cleaned it up that night and things are back to normal. Blogger TaraMetBlog also saw the star in ruin, noting her shock and dismay.